Poster advertising the rules and regulations for boaters and other customers of the Caledonian Canal from 1824. 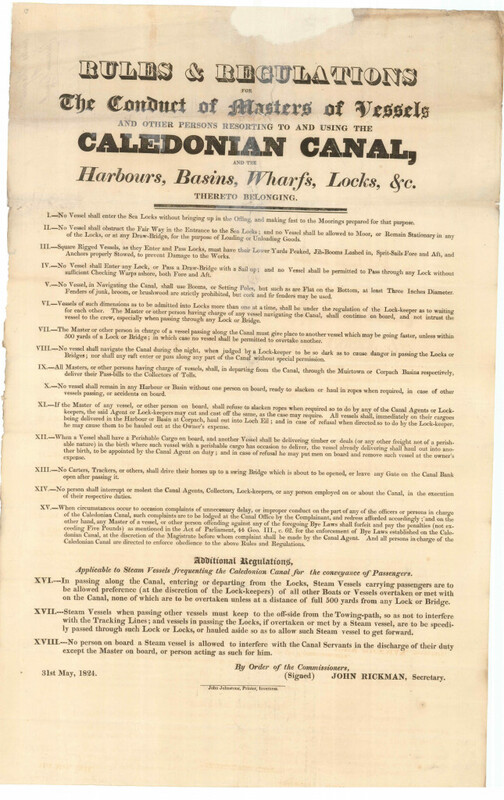 Rules & Regulations for the Conduct of Masters of Vessels and Other Persons Resorting to and Using the Caledonian Canal and the Harbours, Basins, Wharfs, Locks etc. Scottish Canals’ collection of historic manuscripts dates back to the late 1700’s and whilst every effort is made to preserve these precious manuscripts, they are working documents and we take the view that the marks, annotations, and patina tell their own story and should be kept for historical authenticity.